UART in 16bit controllers (dsPIC and PIC24) has a FIFO buffer for their receive and transmit buffers. In 8 bit variants the buffer size is 1 byte. For the PIC I’m using (dsPIC33FJ128GP202) it is 4 bytes and may change with different parts (please read the data sheet for RX and TX buffer size). The peripheral library will take care of the buffer for the most part but not always. So just be careful. In this post I am giving the code snippet without using the DMA feature. Next post I’ll make one with the DMA feature. I am using dsPIC33FJ128GP202 (28 pin SOIC package). 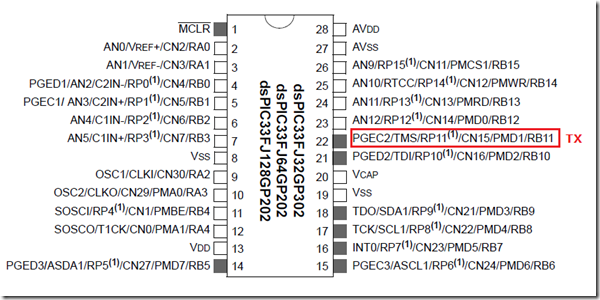 Given below is the image that shows which pin I’m setting in for the TX. I’m using pin 22 (RB11) as UART TX pin. Note: UART has TX FIFO buffer whose size can be found by reading the datasheet. If UART prints only up to maximum FIFO buffer length, then it means TX buffer is full. Using putsUSARTx() function will take care of TX buffer while printing. For manually printing each character, TX buffer has to be handled properly (check the RX code). For the most part the comments tell what the settings do. Also the document DS70000582E ( http://ww1.microchip.com/downloads/en/DeviceDoc/70000582e.pdf) will help with a few code snippets too. In the UART settings you got UART_BRGH_SIXTEEN. Another option is UART_BRGH_FOUR. The way this setting works is by deciding number of clock bits to sample per data bit. This is kind of new compared to the 8bit variants. The above calculation is when defined as a macro, its easy to edit when the baud rate needs to be changed (snapshot below). 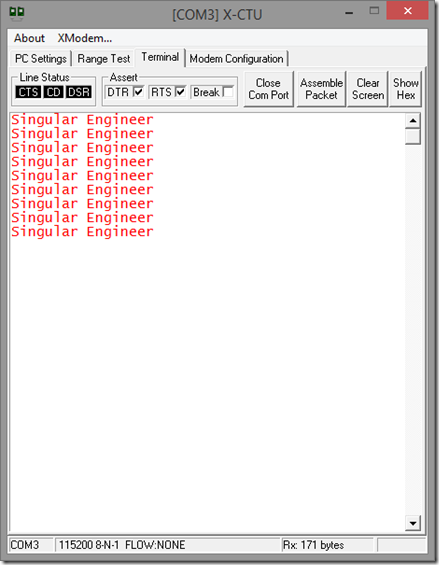 The following code will print “Singular Engineer” every one second approximately. Similar to UART transmitter buffer, the UART receiver buffer is also 4 bytes deep FIFO buffer. So when you setup the interrupt, you got to keep in mind how you set the interrupt to be triggered. If the FIFO buffer is 4 bytes deep, then an interrupt will happen very 4th byte notifying that the RX buffer is full if UART_INT_RX_BUF_FUL option is selected. And so on. 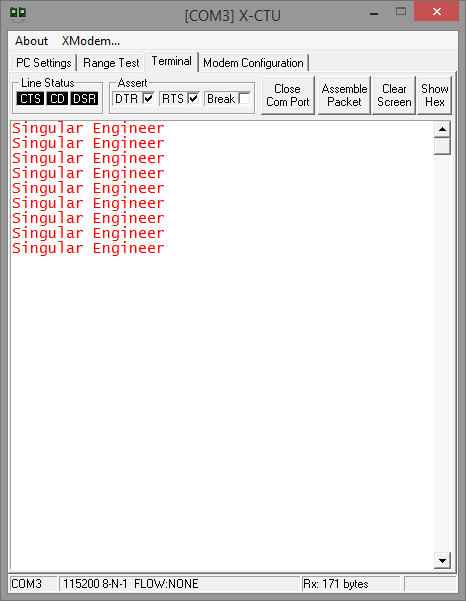 Here for this example I have made UART_INT_RX_CHAR which will trigger an interrupt for every character. If the received character contains a return character ( 0x0D in hex), then it will print everything or if it hits the max buffer size I set.